I have been fortunate to have been well educated. That is schooled both in life and through the more formal teaching systems we move through as we grow to adulthood. I am thankful for both as they have made me a citizen of the universe, aware of the world and each of our lives as something bigger, greater, inter connected. I was chatting with someone the other day who suggested that if I invested in a cottage (or something similar) that it might take away my “need to travel”. My response? “That would make me very sad.” Now don’t get me wrong, I love cottage getaways but they would never fulfill my lifetime wanderlust. Anyone who has followed my blog with regularity or knows me, is well versed with how important travel is to me. We all place value and priority on different things; accelerating our career, building a home, raising children, helping others…and the list goes on. There is no right way. We are all on our own quest and thankfully our fulfillment comes from many different paths, people, places and experiences. No text book could have given me what I've learned, shared and witnessed in my travels. How to quantify what one learns as a solo female traveller, being intentionally directed to the men’s washroom on a rickety boat in male-dominated Indonesia? Or by having all your identification and money stolen six weeks into a six month journey in Australia? Or by being detained my Russian police for taking a photograph without permission? These experiences and many more have been invaluable in schooling me about world, politics, religion, conflict, struggle, relationships... No matter what we have experienced along the way, travel promises to challenge our ideas and what we know of ourselves. On the road uncertainty is the only constant. I don’t travel in luxury, in fact far from it. My accommodations and transportation are an inconsequential part of the greater experience of being there. 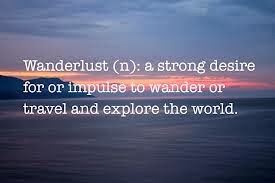 So, if you are an aspiring globetrotter, travel now. Do not wait until you have more time, more money, more this or that. Those days may never come. I believe that the less you need, the richer the learning. When you are old it will be your memories you look back on. Make them great. After all, regrets are more expensive than a trip could ever be.